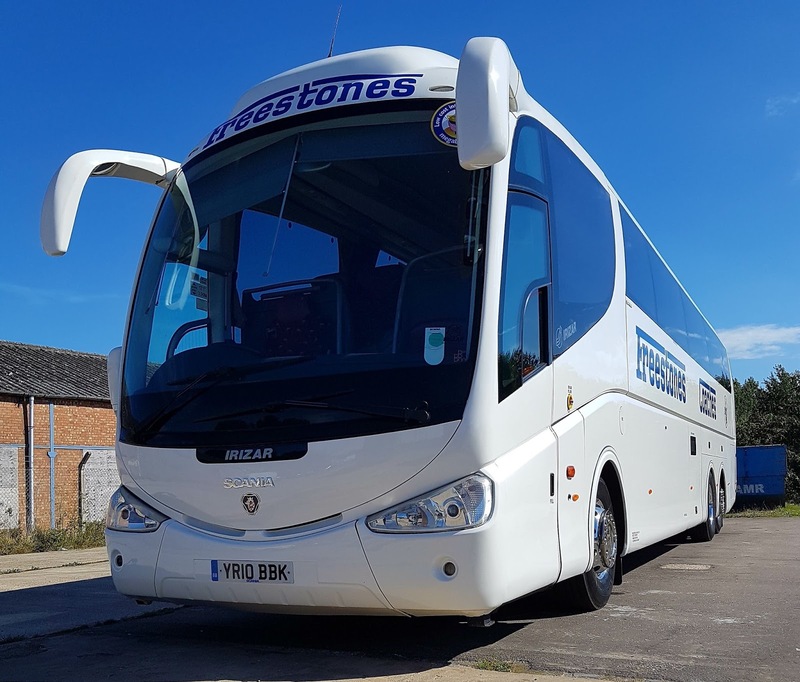 Earlier this year Stagecoach Norfolk withdrew the remaining Optare Spectra Double deckers in its fleet and one has made its way up to the North West and found a new owner. YJ51ZVF was new to Reading Buses as their 722 before being aquired by Norfolk Green at Kings Lynn, it was number 7 in their fleet before being renumbered to 13981 when the company was taken over by Stagecoach. It is seen above in its new livery of Pilkingtons of Accrington in Lancashire. 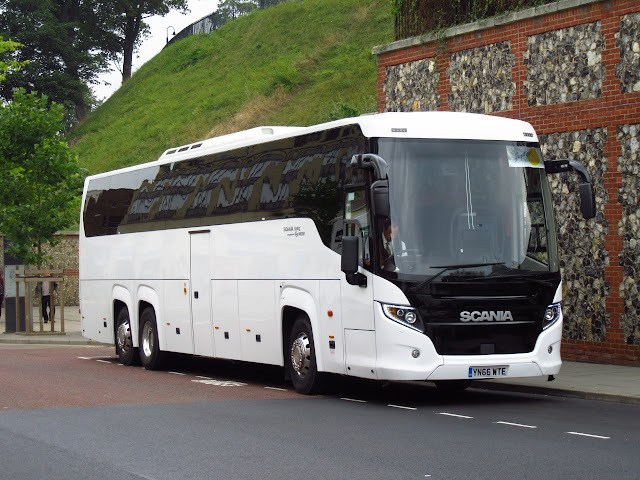 Robert Kelly subsequently contacted me and says 'the body configuration was C45F and it stayed with Norfolk Motor Services until December 1977 before later going to Granville Tours. He says that 'while walking back to work on my lunch break I crossed over and noticed an unusual bus working the X11 which was none other than a Dennis Dart'. Subsequent to this post Richard Woods contacted me and suggested 'it may be the case that it was a short run working from Market Gates rather than through from Norwich. I work in Acle and overlook the route, so I see most of the buses out on the road. Nicky Pursey contacted me yesterday regarding some bus antics at Beccles on Saturday afternoon. 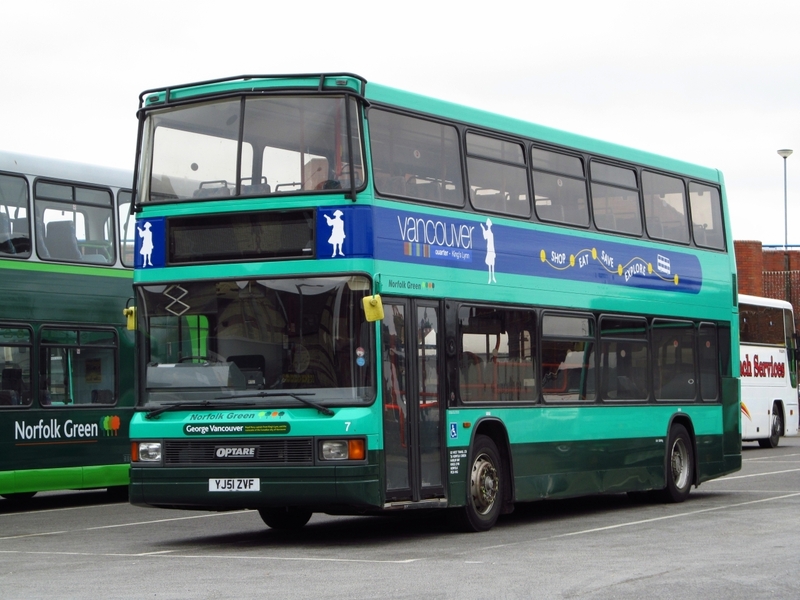 The East Anglia Transport Museum was running one of its regular outings to Beccles with one of their vehicles; former Eastern Counties Bristol FL6G 557BNG. However, it was declared a failure at Beccles with TWO punctures, which meant ASW Recovery Services being summoned. Nicky said it was incredible watching the driver manoeuvring the vehicles around the Old Market Place effecting the recovery. On my way back from the Trolleybus Weekend, on Sunday afternoon, I thought I would try and find the Lowestoft operating centre for Suffolk Norse. In the PSV Circle's Suffolk Fleet Publication it is listed as the Highways Depot, Mobbs Way, Oulton Broad Industrial Estate. Accordingly I turned off Yarmouth Road into Mobbs Way and continued to the western extent of the road and no sign of it! However, a small road off to the south led to the centre and three 'full sized' coaches were parked up. 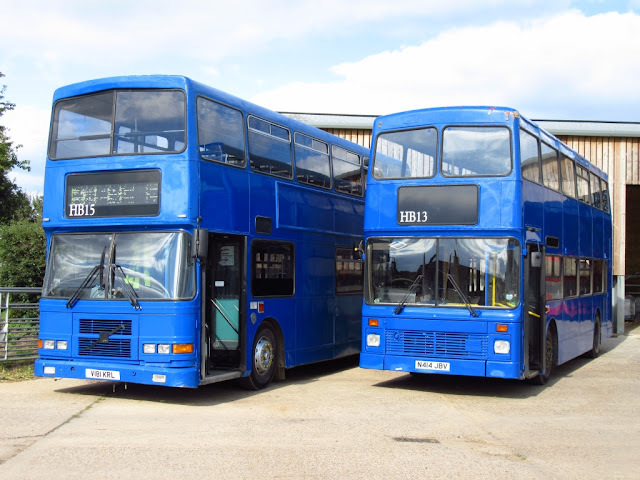 The trio comprised Alexander Dennis Enviros SN56AYL and SN56AYP with third being Dennis Javelin YO52FHJ. 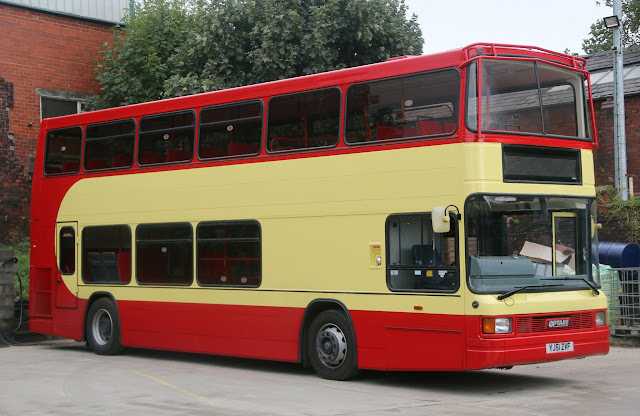 Accordingly a ride was secured on Maidstone Corporation Trolleybus 52 (LCD52) and, again, I did a double take when passing Ashton-under-Lyne trolley 87 (YTE826) painted in similar colours to the old Great Yarmouth Corporation livery! The visiting buses included a Midland Red coach on the Saturday, a London Transport Green Line RF on both days plus a former Eastern National Bristol Lodekka FLF6G on the Sunday. The third visitor was NTW942C an ex-Eastern National Bristol FLF Lodekka with an Eastern Coach Works body dating from 1965. A visit to Bury St Edmunds yesterday and I noted some changes there since my last time there in early August last year. The front part of the travel office at the bus station hads been divided off and available for lease whilst the waiting area and toilets at the rear were retained for passenger use. 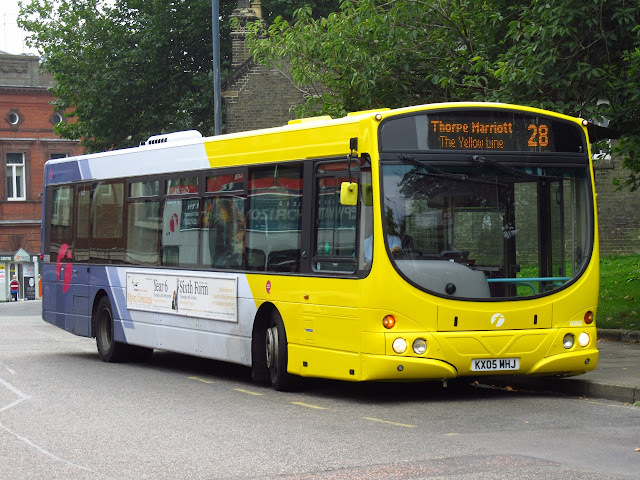 Stephensons continue to operate Bury town services since it 'breezed' into the town in October 2011. However, the Darts employed then appear to have been replaced by ADL Enviro200s with 431-4 (EU10NVP/R/S/T) being noted. These newer saloons had been transferred in from use on 'the Blackwater Link' between Witham and Maldon with two of them still branded as such. I also observed two of Stephensons single deckers branded for its Suffolk Rider service which runs from Newmarket to Bury via Mildenhall; they were Enviro200s EU60CBF and YX11CTU. Often one of the operator's deckers is seen and yesterday was no different with ex Transdev/London Sovereign Scania N94UD/East Lancs YN55NKH putting in an appearance. On my last visit, Stagecoach East was employing similar vehicles on its service 11 between Cambridge and Bury but this time Enviro400s were employed with 15458/61 (AE09GYF/N) and 19164 (MX07MNF) being observed. The latter was wearing the Cancer Research livery. Volvo B7BLE/Wright Eclipse Urban 2 21227 (AE09GYX) also worked the route. Mulleys of Ixworth continues to operate local services and can often be relied upon to provide unusual buses in their orange livery. A trio of former Nottingham Scania CN94UBs were viewed including YN54AHA/D/E, but the star of the show was decker MUI7949. This was a former Dublin Bus Alexander ALX400 bodied Volvo B7TL thought to have been new to them in December 2001/January 2002 as their 01 D 10202. 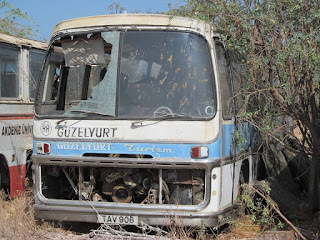 The registration, incidentally, was previously used on ex Anglianbus R86EMB when operated by Mulleys. Chambers was employing ex Metrobus Scania Omnidekkas on the 753 route between Bury and Sudbury with YN55PZD/E/G being recorded - these are from the same batch that saw three moved to Anglianbus. Chambers Enviro200 EY57FZE was laying over at the bus station at lunchtime. 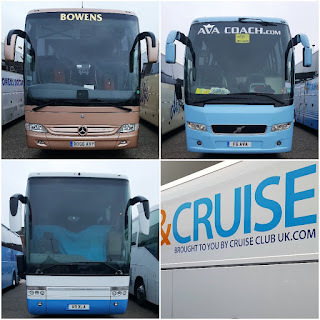 Other operator's vehicles regularly arriving included Coach Services, Galloways and Simonds with the first named utilising deckers Plaxton President bodied Volvo B7TL X509EGK and ex Stagecoach London Scania LX59CPK. National Express also serve the town with Whippets Volvo B9R bodied Caetano Levante BK15AKF seen heading off to Stansted Airport. The odd day tripper also looks in with Andrews of Foxton Scania/Irizar RUI9414 paying a visit. Further to Roy's post last week regarding Reynolds Dennis Javelin BIG8773 being up for sale, it looks as though the sale has quickly gone through as it was noted this morning wearing trade plates and its registration taped over and had left the Ormesby Road garage for pastures new around 11.00am, i did just happen to be on my way home and noticed it! 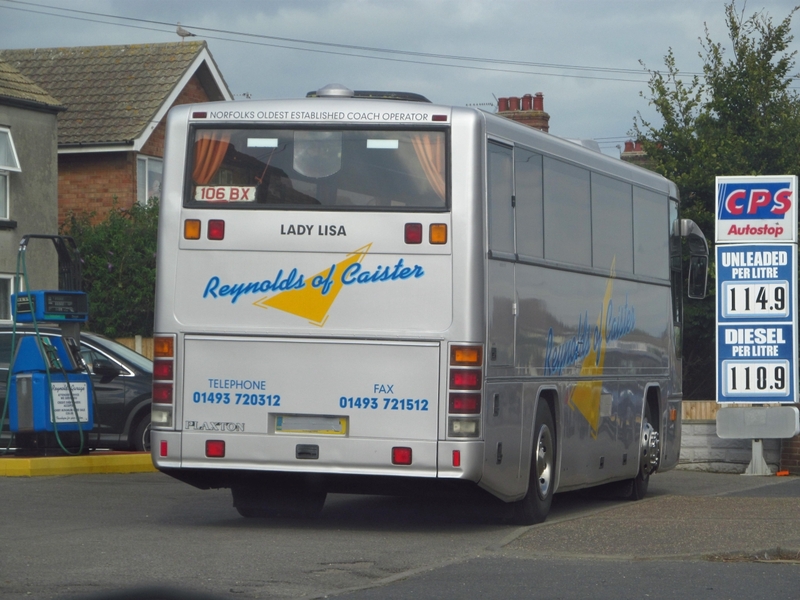 Lady Lisa about to head off to her new home. 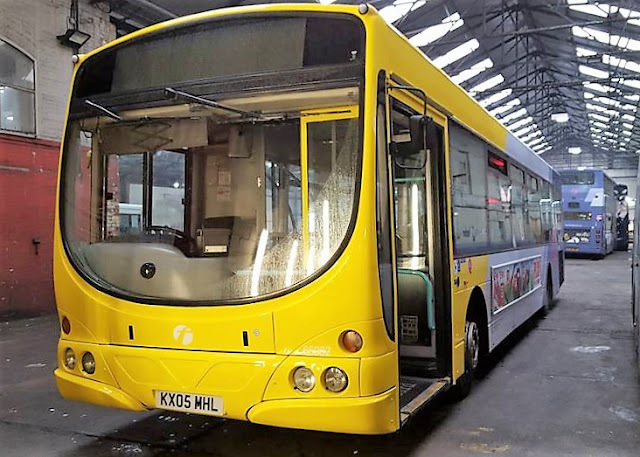 Also at the garage was one of the latest arrivals AT55CZJ now wearing full livery and fleetnames, along with all the Reynolds fleet it has gained a name and it is now Lady Clio-Grace. I recently contacted Mr Reynolds and myself and Roy have been invited to meet up in the near future to speak about the latest arrivals and have a look around. A Day off work so i decided to venture across to Norwich to catch up with photos and a lunch appointment with First Eastern Counties newly appointed Head of Operations Chris Speed, most of you will know i have been friends with Chris for many years and its good to hear how things are progressing at First and what is in the pipeline for the company. 66982 KX05MHL now wearing Yellow line livery. My first 66 plate Coach was noted outside Castle Mall, YN66WTE a Scania belonging to K&E Horton of Wolverhampton was collecting passengers on a Just Go Tour. 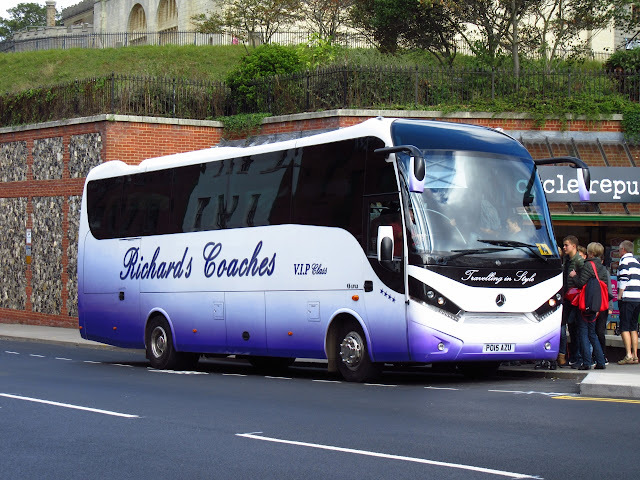 Another coach at Castle Mall was a local visitor, PO15AZU is a Mercedes minicoach belonging to Richards of Guist in West Norfolk, it was new to them in April 2015. Final shot is Awaydays recent Open top arrival X589EGX pictured in a sunny Theatre Street collecting passengers for a tour around the city, both open top vehicles were in use yesterday, Olympian G520VBB was also enjoying the September sun. Once again its time for a local farm to increase its workforce. 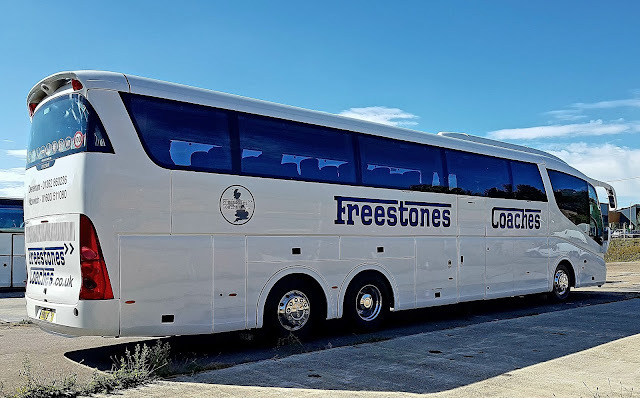 Hirsts Farm in Ormesby St Margaret has supplied us with posts in the past regarding vehicles used to transport workers to its site and the first two of this season were noted yesterday in the village. The vehicles are operated by Shropshires of Barway in Cambridgeshire. 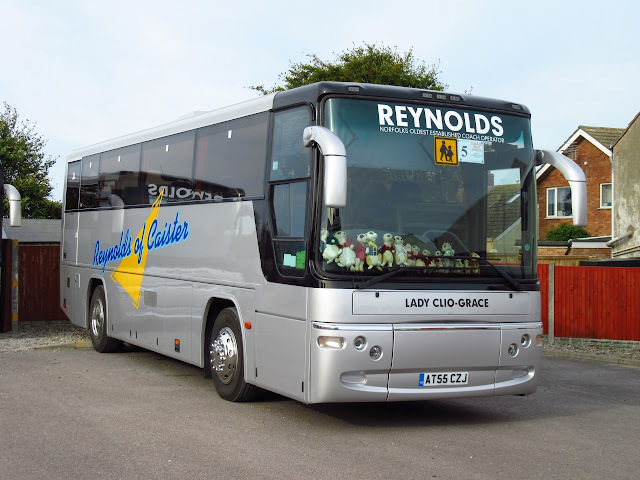 Two were noted yesterday, Olympians V181KRL and ex London Central NV14 and latterly Aintree Coachlines N414JBV. From Sunday 25th September, the 1 & 1A First Eastern Counties service along the east coast will be changing to its autumn & winter timetable. 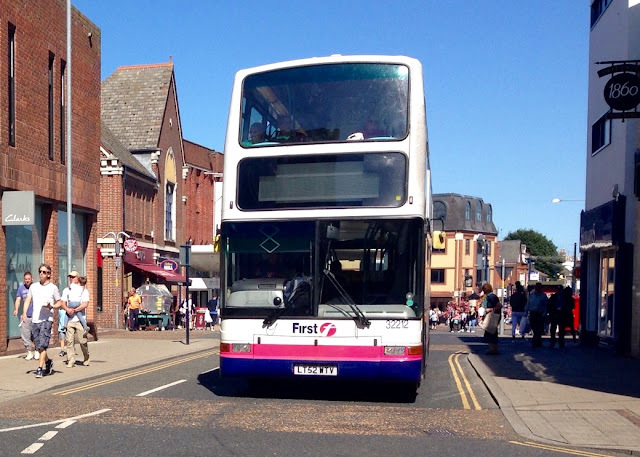 This means that 1B buses between Hemsby Beach and Great Yarmouth will no longer operate. However, there will be a bus up to every 30 minutes during Mondays to Saturdays during the day along the main route between Martham - Hemsby - Caister - Great Yarmouth - Gorleston - James Paget Hospital - Lowestoft, with buses up to every hour on Sundays. A revised timetable will be in operation to aid punctuality with all journeys will operating through Kessingland village in both directions. Buses will continue to connect with Konectbus 7 at Great Yarmouth Market Gates for Norwich. The afternoon 87, 88 and X88 departure times are being revised to aid punctuality during the afternoon peak. 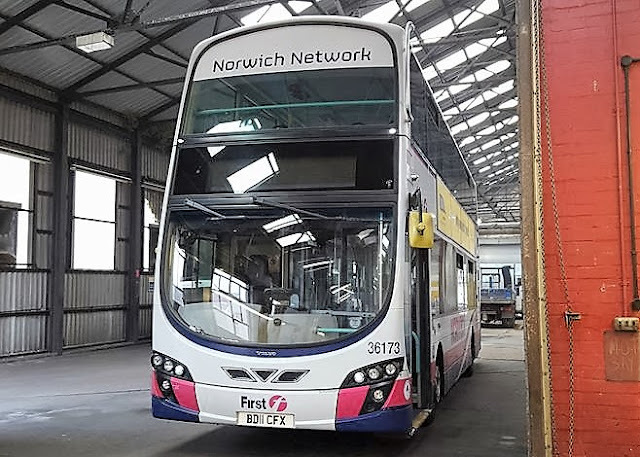 Additionally the 21:30 87 service from Norwich to Bungay will run 30 minutes later in response to the request for a later bus. The 1715 88A service from Halesworth will operate 10 minutes later at 1725. 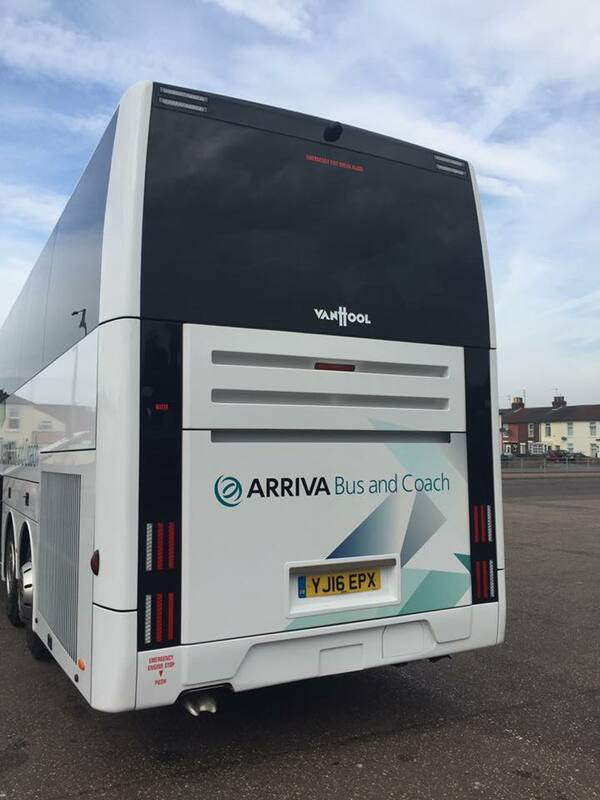 A revised timetable will be in operation with buses departing Great Yarmouth Market Gates at 20 and 50 minutes past the hour. Theywill continue to leave Norwich Bus Station at 10 and 40 minutes past the hour. 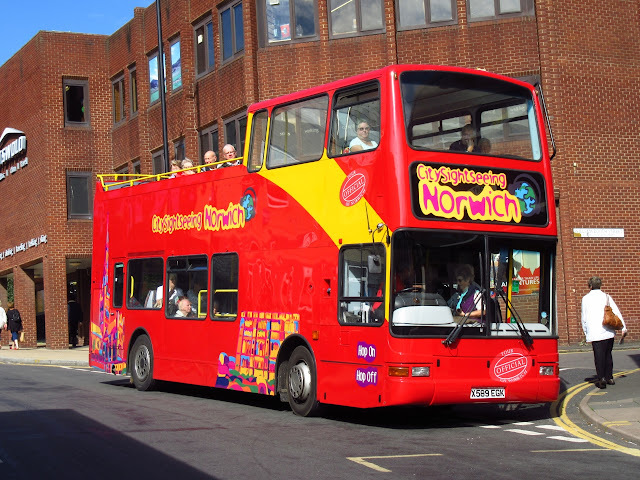 The last bus back from Norwich Bus Station to Great Yarmouth will be at 1840. 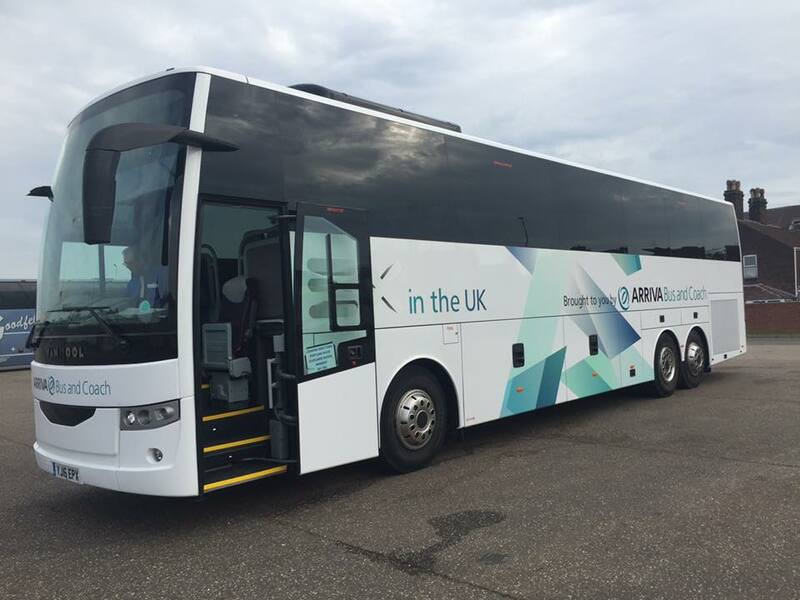 Buses will continue to connect with Anglianbus 61 from/for Gorleston, Lowestoft and Kessingland with through tickets being available. A revised timetable will operate with the service being renumbered 73. 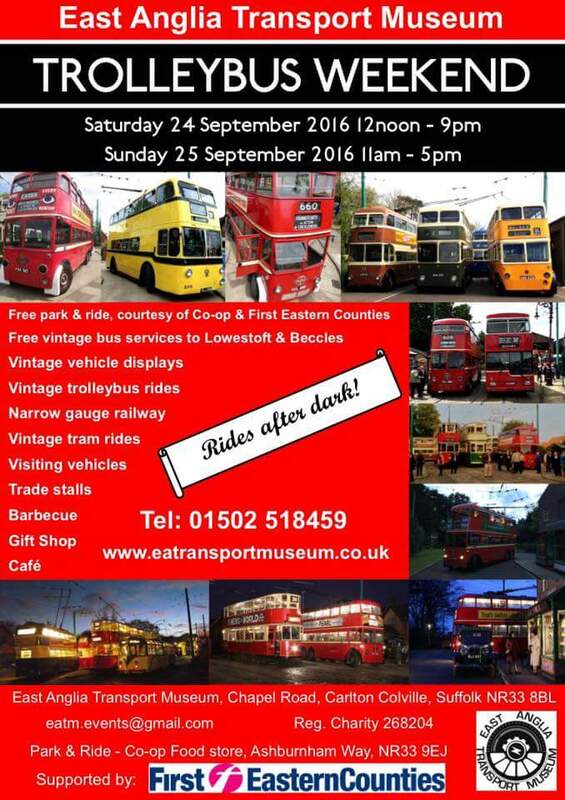 This year's Trolleybus Weekend will see all available vehicles from the fleet in use and, as the nights begin to draw in, there will be running after dark on the Saturday. On Thursday last I was contacted by 'Reg Vardy' offering me a place on the Ipswich Transport Museum's bus to the North Norfolk Railway's 1940s weekend. Whilst the Saturday definitely wouldn't be a goer for me, the Sunday might be ok - until a family commitment put paid to that! However, I was provided with a timing so that I could get a photo opportunity of an Eastern Counties LL travelling through Gorleston on a Sunday morning. KAH407, a 1949 example of a Bristol L chassis with Eastern Coach Works 35 seater bodywork, was running a little late though. The rear entrance bus carried fleetnumber LL407 until becoming LL907 in 1964. It was withdrawn a year later and passed to dealer Ben Jordan of Coltishall. It then moved on to Drewery of Chigwell, and then Winlon Autos of Harrow before being purchased for preservation by the West of England Transport Museum, Winkleigh in October 1969. It was acquired by Ipswich Transport Museum in January 1977 after ownership by two different Northampton based preservationists. After a full restoration KAH407 returned to service in 2001. Many of you will know that First Norwich buses have their annual MOT inspection at Great Yarmouth's Caister Road depot. Arriving in Regent Road, I observed one of the said Geminis awaiting time for its 09:35 departure for Bungay. It was LF52ZPB which was new to London General in December 2002. That's one ticked off the list then! My second goal of the morning was to get a photo of the Our Bus 271 Hemsby Beach to Great Yarmouth service, which started on the 30th August last. The service involves two outward and return journeys on Mondays to Fridays and I was surprised to see a new addition to the Our Bus fleet in charge. Optare Solo CN54HFD was employed on 09:45 Hemsby departure and seemed to be well patronised. The Solo was noted on the internet as still being part of the Chippenham based Faresaver fleet in September 2016, so a very new acquisition. With the second one also ticked off I had accomplished both of the tasks I set out to achieve! Simon Taylor was driving past Great Yarmouth's Beach Coach Station 'this morning and saw a rather eye catching coach from Arriva Bus and Coach. Simon says 'I'm not a usually a one for coaches but I did like bumping into this one this morning'. To tide Spratt's over until replacements arrive, they have hired this Bedford YNT from one of their own drivers Simon More who is based at Rollesby. Simon is using the vehicle himself on route 7 in and out of Stalham's High and Middle Schools.